Here is the magazine you've been waiting for. It's for folks who are seriously into plants, but who are finding main-stream gardening magazines too commercial and ordinary. Are you a plant collector looking for more information? A rare plant enthusiast seeking depth? Maybe you just want to learn more about interesting and curious plants that are rarely covered in commercial magazines, and, where to buy them and how to grow them? 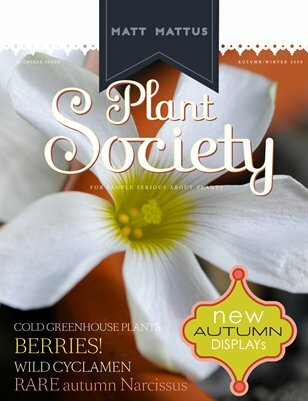 Plant Society Issue 2 focuses on cultivating miniature species Narcissus for cold greenhouses and alpine beds, odd and rare winter blooming bulbs, Cyclamen species in pots, winter shrubs for color in the garden, design, inspiration, and more. A magazine which expands on the idea of the popular rare plant blog GROWING WITH PLANTS, a gardening diary blog by designer and plant geek, Matt Mattus.